The Dracula's Castle was built on the border between Transylvania and Wallachia and is famous mostly because it was the home of Dracula. Dracula was the Wallachia (Medieval Romania) king. His hystorical name was Vlad Tepes (Vlad the Impaler). He was born in Sighisoara (Transylvania province) and very cruel, especially with thiefs and country enemies (turks). The condamned was introduced in the tip of a tall sliver (3 meters), vertically fixed on the ground. The death was produced by the loose of the blood. 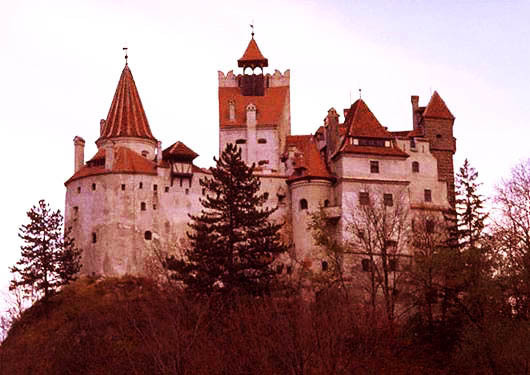 Nowadays guests worldwide wish to seek Dracula’s real castle in the legend of the Count Dracula. The most-used residence of Vlad the Impaler, the “real Dracula,” is called Cetatea Poienari, which is still partially in ruins . The other is Bran Castle , well known as Dracula's Castle , located in Poiana Brasov, near the city of Brasov. Originally built as a fortress starting in 1377, the building has been in some kind of use almost continuously since then, including now as a museum. This castle is supposed to be Dracula castle since its narrow corridors constitute a mysterious labyrinth of ghostly nooks and secret chambers easy to hide a "vampire".